The $90 Pad & Quill Contega Thin is similar to the Contega Linen, which I reviewed a few weeks ago. It shares the same Moleskine-style elastic band for closing the cover, and the exterior is still wrapped in durable linen. It’s still a great case for adding scratch and drop protection, without sacrificing on class. 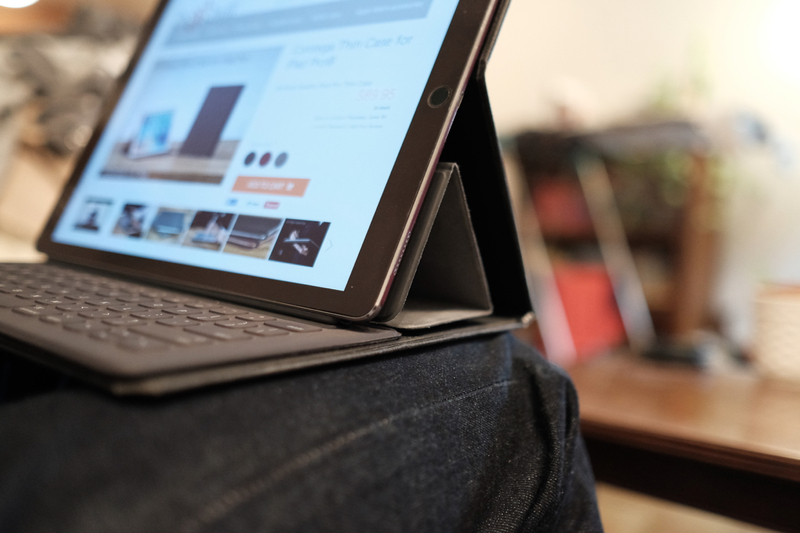 Adding a Contega to your iPad Pro is like dressing it up in a sports jacket with cleverly hidden elbow pads beneath. But the Contega Thin makes a different set of concessions in its design than the thicker Contega Linen. Instead of housing the iPad Pro in a gorgeous wooden frame, the Contega Thin uses a removable 3M adhesive to bind the iPad to the case. This makes the install a little tougher initially because you need to be more careful about how you line the iPad with the adhesive. Thankfully, the 3M sticker is both strong and forgiving — meaning that it can stand repeated installs. Once the iPad is set, you’ll completely forget your gigantic tablet is tethered to the case by a thin layer of adhesive. Your iPad Pro will not be falling out.